zzz GENERALLY speaking, it is easier to paint thinly than it is to paint with thick, rich strokes of color. It is also better to start painting thin and work your way to thicker paint applications. 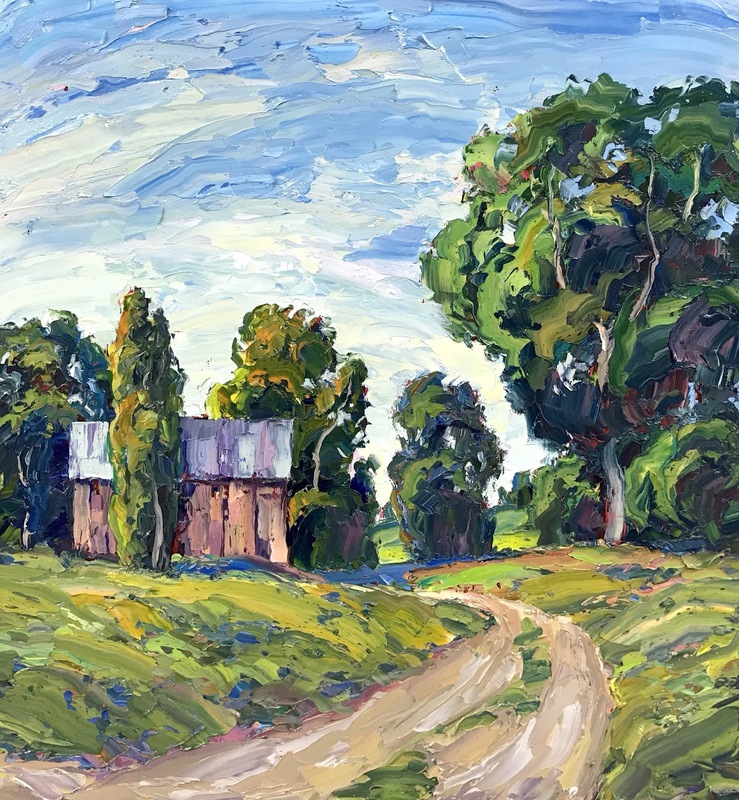 The reason is that thin painting can be tentative–you can slowly build up the paint layer and adjust color and value very slowly via dry brush, glazing, or scumbling. Mountains near the Maynard Dixon Studio. Mt. Carmel, Utah. In this painting, I have kept the paint film quite thin. This allows for additional paint after the initial thin layer has dried. 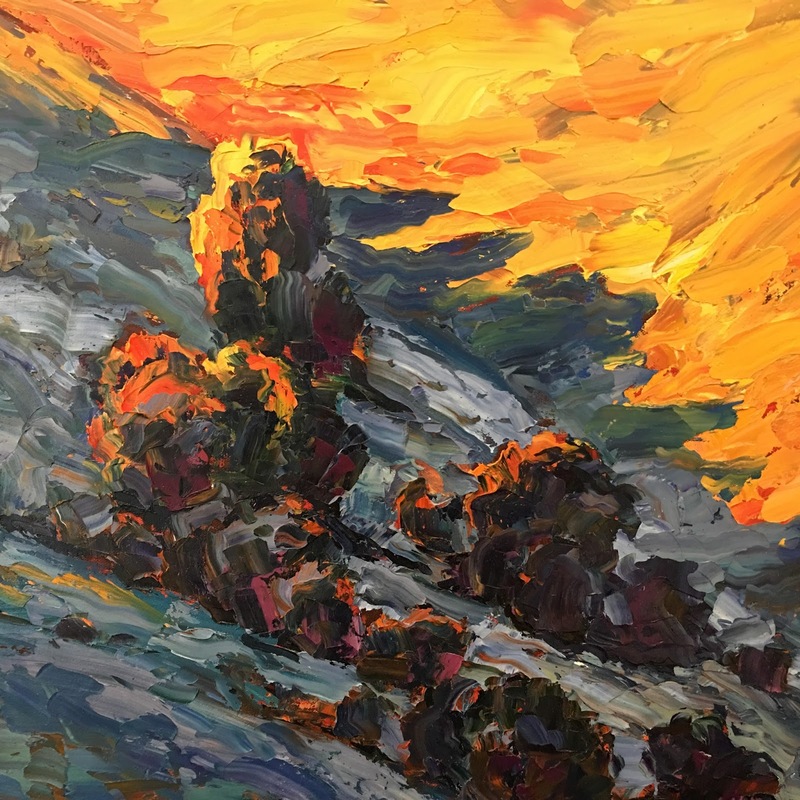 If it had been painted thickly, I would have had to scrape off the large impasto strokes using a sharpened ceramic loop tool or a canvas scraping knife to add additional texture. If the surface is too textured all subsequent manipulation becomes more difficult. For example, imagine trying to glaze on a highly textured surface. Parts of the glaze with sink into the clefts of the strokes. The ridges would get less of a glaze as some pigment would naturally sink into the clefts. This is essentially what happens when someone antiques a painted surface when they are refinishing a piece of furniture. In a painting, it can give an odd, uneven effect that I try to avoid (although I do use the effect occasionally in my acrylic abstracts). If you have tried applying thick paint and have not had as much success as you want I highly recommend painting thinly and gradually increasing the thickness of your paint. If you look at Van Gogh’s paintings in chronological sequence, you see that he started painting quite thinly, almost with the thinness of an academic painter, and gradually increased the texture as he matured artistically. If you find the thick paint defeating your intent from time to time drop back to a thinner style for a few paintings until you get your courage back, then dive into thick paint once more. –I HAVE read how many artists avoid using black paint at all costs. Some even decry it as not being a real color. Which is somewhat ridiculous. If it wasn’t a color that would mean it didn’t reflect light and would be a sort of black hole of reality, sucking in light but reflecting nothing. It is more accurate to say that black is a color that is extremely dark and extremely neutral. In a few minutes, I’m going to broadcast live (16 Jan 2019, 12:30 MT) on my Instagram feed where I will add green to a painting using black, cadmium yellow, and yellow ochre (and possibly some ultramarine blue). In the demo, it will become evident that black is a color and of use to the experienced painter. Black with a touch of ultramarine blue is a beautiful color and is often sold as Payne’s Gray after the 18th-century British watercolorist William Payne. You should always bias your blacks so they are leaning to either the warm or cool side of the spectrum. I also suggest adding a hint of white to bring out the tonal beauty of the color. Also, remember that no dark color should occupy no more than 5% of an extremely dark range. Use those super darks for notes within your dark shapes. 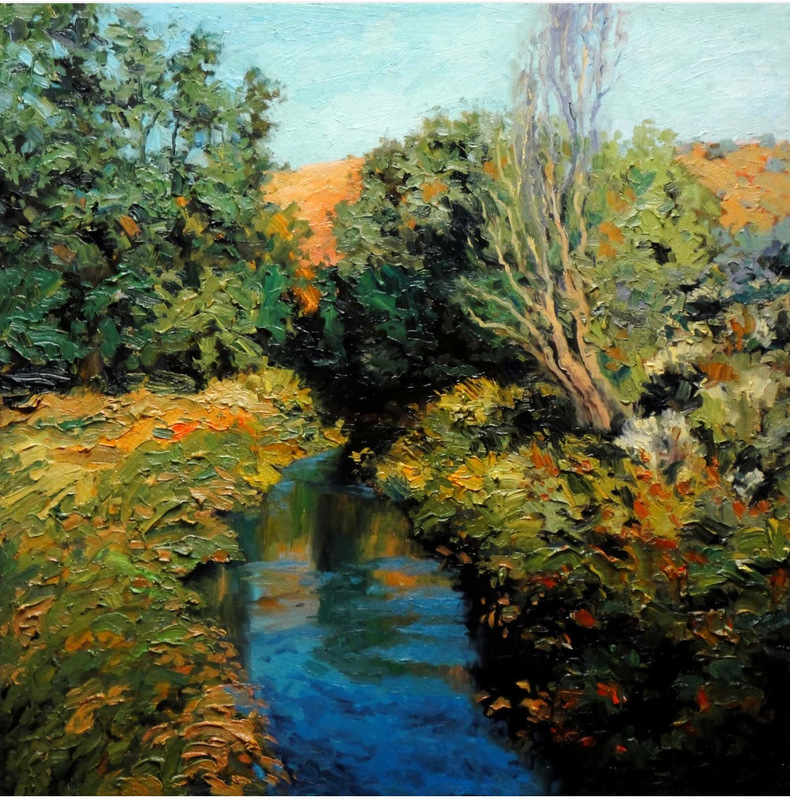 –IT has been a lifelong ambition to get gallery representation in Santa Fe, New Mexico, which is the third largest art market in the world and the primary market for the kind of textured impressionism that I do. 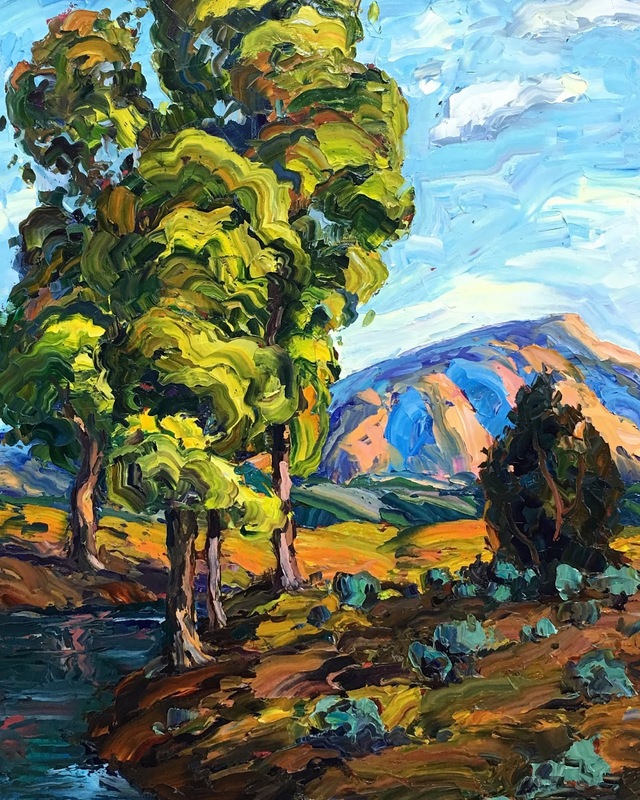 Due to a series of fortuitous events I recently connected with Manitou Galleries which has a gallery on Canyon Road and another near the Plaza on Palace Avenue (where my works are currently exhibited). If you are in Santa Fe I hope you will drop by and take a look. Both of the Manitou galleries are excellent and I’m honored to be included in their roster of amazing artists. –WHY do some people love art and others seem unmoved by it? I’m always interested in the reaction of people who visit our home. Our living room has art hanging from floor to ceiling. Some people don’t even notice–which always intrigues us since our collection (which includes an original work by Carl Bloch) is such a prominent part of the room. I’ve always assumed that with enough persuasion nearly anyone could be convinced that life with art would be superior to one devoid of art (read my five reasons to collect art here). Despite straining my persuasive abilities to the limit I don’t think I’ve persuaded anyone to collect art. It seems that needle is very difficult, if not impossible, to move. Above: Grand Canal, 24″ x 24″, (sold). The last video (above) was filmed on April 5, 2016, over two years ago. It was at that moment I knew I wanted to mount a show of paintings based entirely on imagery from my graphic novel but the technical means had not presented themselves. It took two years of rumination and one week of exposure to new ideas to finally move forward with the show. I’m extremely proud of the show and hope you will be able to drop by for a visit. It will be on display until May 25, 2018. Above: Your Move, 48″ x 24″, acrylic markers on canvas, available at Alpine Art. –IT is a good idea when having a show to write a brief press release. Press releases are prewritten articles to intrigue journalists into investigating more or to use as copy for their respective publications. The main point is to convey important details while entertaining the reader. The more unusual the show the easier it is to find a unique angle to promote the exhibit. A good rule of thumb is don’t be boring. After you write the basic text, edit out any detail that isn’t informative or doesn’t have entertainment value. 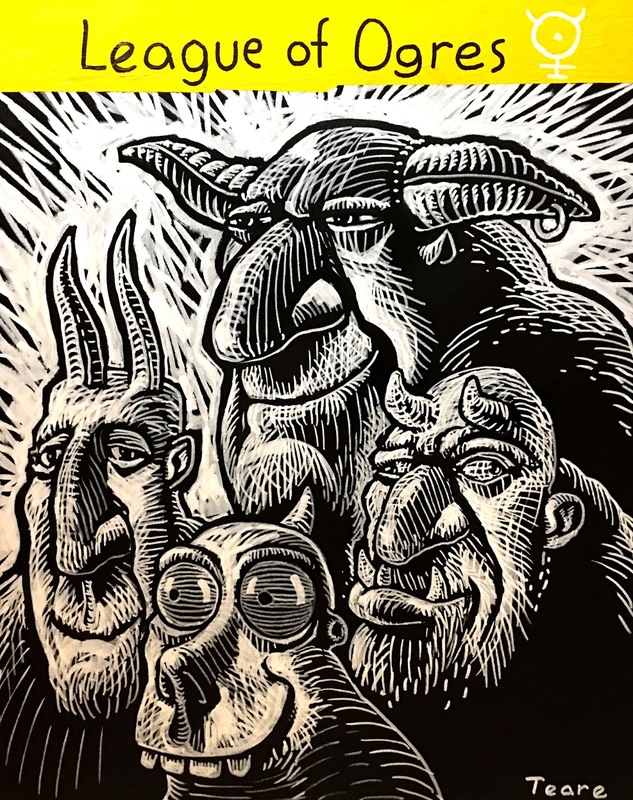 Persistence of Paradox simultaneously explores the visual complexity of Brad Teare’s graphic novel Cypher and the significance of its quirky, Jungian mythology. Teare uses the medium of acrylic markers (the markers graffiti artists use) to develop and expand the surrealist imagery revealed in the original book. 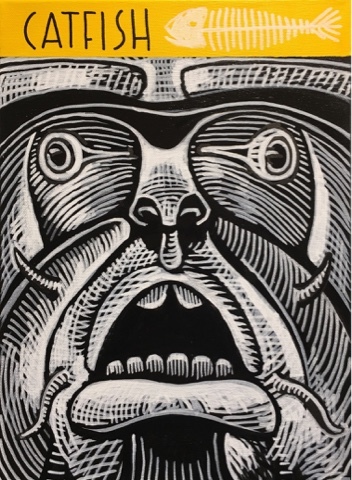 Teare discovered that by using white markers on canvas painted with black acrylic paint, he could replicate the look, and more importantly, the state of mind, of working in scratchboard and woodcut–the original mediums of the comic book. The exhibit continues that impulse by visually exploring the mystery of life–with all its paradoxes. Some of the comic pages are meticulously painted onto canvas at ten times the original size. 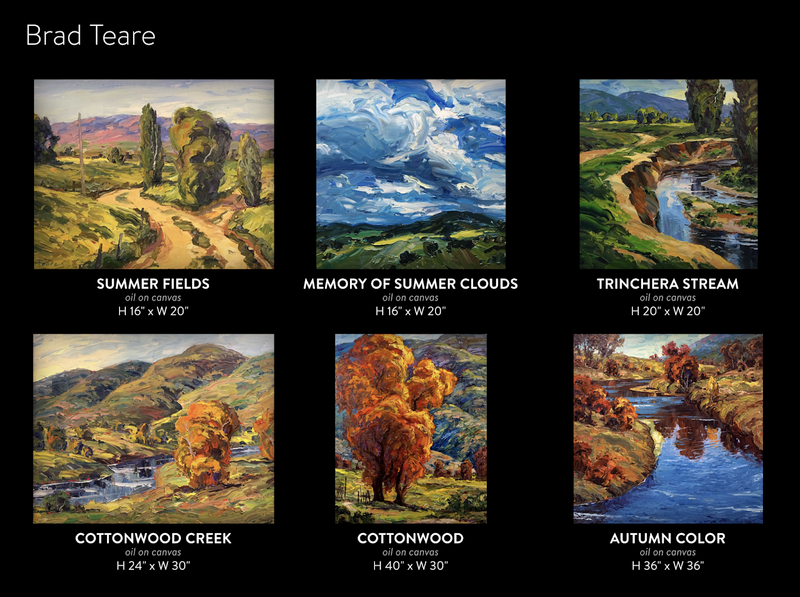 Smaller paintings are tributes to original characters and include Salvador Dali, M.C. Escher, as well as a cast of archetypal icons from Femme Fatale to the League of Ogres (a crew of motley Hades-dwellers). Although the show consists primarily of works on canvas, included are two sculpture/assemblages that pay homage to iconic scenes in the series. 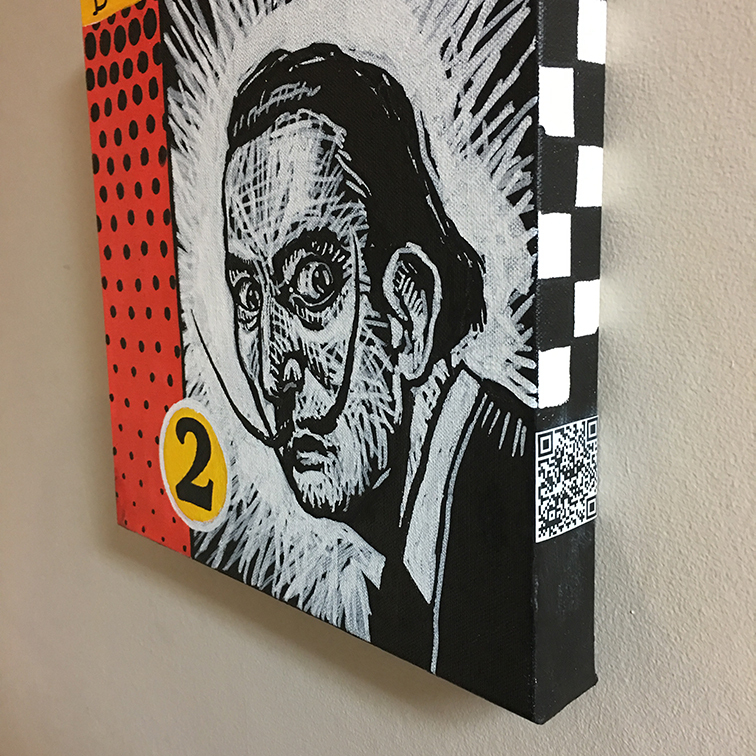 Teare has attached QR codes to many of the artworks and attendees can use their phones to access additional surrealist and explanatory video. 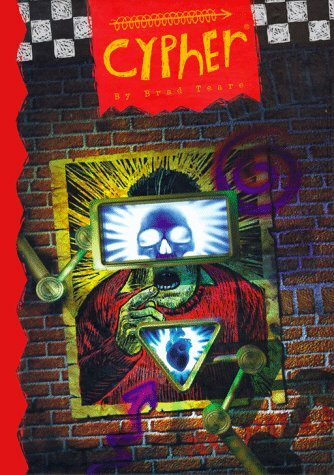 Cypher originally appeared in Heavy Metal magazine and was later published as a graphic novel by Peregrine Smith Books. It was critically acclaimed and received accolades from the Spectrum Annual, Fantagraphics Books, as well as Simon & Schuster’s Comics Encyclopedia. His work has appeared in the New York Times, Paradox Press, as well as many other comics anthologies. While living in New York, he illustrated books by Alice Walker, James Mitchener, Ann Tyler, and many others. He now lives in Providence, Utah. –I was honored that clinical psychologist and Youtube superstar Jordan B. Peterson sent me a review copy of his book 12 Rules for Life: an Antidote to Chaos. This blog has a comparatively small readership and any review I write would hardly budge the needle of the book’s sales–which currently trends near number one on nearly every booklist. I appreciate Peterson’s generosity and willingness to share his book. Peterson routinely talks with people such as Jonathan Haidt (who wrote one of my favorite books The Righteous Mind: Why Good People are Divided by Politics and Religion) and recommends complex analysis of inequality in books such as The Great Leveler, published by Princeton University Press. I view Peterson as a force for rationality, but I knew his book would invite condemnation. Despite my expectations, I was surprised by an attack from The New York Review of Books. It was less a review and more a compendium of logical fallacies. Because of such attacks and such disregard for diversity of thought, I felt compelled to review Peterson’s book. The bulk of the book offsets many erroneous and detrimental ideas. Young artists will find concepts to help with self-confidence (Standup straight with your shoulders back, rule 1), networking (Make friends with people who want the best for you, rule 2), finding an authentic style (Pursue what is meaningful, not what is expedient, rule 7), and how to write an artist statement (Tell the truth–or at least don’t lie, rule 8). The tone is as refreshing as the content and for most readers, there will be plenty to think about. Ironically, 12 Rules for Life is not overtly political–there is little to object to from any political perspective. That isn’t to say there aren’t missteps. I felt his citation at the beginning of the book that order was a masculine principle and chaos a feminine one was sure to invite criticism. From Peterson’s lectures, I understand what he meant. The role of modern women (radically transformed via medical innovation) has no archetypal analogy. At 60 years of age modern womanhood is too new conceptually to have evolved a genuine cultural archetype. It would have been useful if Peterson had mentioned this perspective. Some will find Peterson’s perspective at odds with art-house philosophy. But I challenge you to give his ideas a chance. Artists, above all people, should have the courage to think differently and Peterson’s ideas are currently out of step with current ideological fads. Don’t make Peterson an offender for a word but try to understand the concepts as he intended. Most artists will be greatly rewarded. Over the years I’ve had the opportunity to mentor young artists. Their philosophies of art are often infused with an unfortunate postmodernism, especially if they’ve attended a public university. Such artists have a grudge against the rich, the very people who will buy their art. They embrace odd theories about art for the masses. One artist, a painter who had great potential, decided he didn’t want to sell his paintings anymore because it was “just rich people” who bought his work. I have met many wealthy people in my career, and I have yet to encounter one I would consider a “robber baron,” or anything even close. Most educated people see such stereotypes for what they are–crude attempts to dismiss intelligence and competency. Highly competent people know how the world works, either intuitively or by experience, and what will make them better people. That is why they are successful. Their success is why they are rich. That is why successful people buy art and want to help artists with their careers. I reject the idea that art is only bought by the rich for suspect reasons, like trying to impress others. None of my patrons are compelled by such shallow motivations–primarily because such motivations are not conducive to success. Knowing that my art will inspire and challenge the owners of my paintings and, perhaps more importantly, their children, is a great source of satisfaction to me. Being a part of the upward drive of the human family is deeply humbling and rewarding. One patron organized and sponsors a charity that does spinal surgeries for Peruvian citizens and has helped thousands to lead productive lives. Others fund arts events and organizations on a massive scale. Reflexively stereotyping people with money often means demonizing highly-competent and successful individuals–hardly a virtue. It is likely that people who support the arts financially are going to be wealthy. This is true even with postmodernist art–an irony since postmodernists disdain the rich. This is reality: despite the utopian dreams of art professors, if you are going to have a career in the arts, you will be working with the successful and the wealthy. It takes care and character to treat people as individuals rather than members of a social group. But it is the right thing to do. Dr. Jordan B. Peterson’s book 12 Rules for Life: an Antidote to Chaos is an excellent wakeup call to artists laboring under postmodernist burdens. Although the book is not specifically written with artists in mind each chapter details methods artists can use to have successful careers (and lives). His ideas are firmly planted in reality, with solid scientific research, and are an antidote to the patently erroneous theories plaguing so much of modern culture. For many, it will take some humility to fully embrace Peterson’s ideas (he can be pugnacious at times). I was taught fallacious postmodernist theories 40 years ago when I was in art school. They didn’t work then, and they don’t work now. Success is predicated on an ability to deal with the world as it is–not as a theoretical utopian fantasy. Once you decide to make peace with reality Dr. Peterson’s ideas will begin to resonate. If you are looking for a book that might not be your usual reading fare, I highly recommend 12 Rules for Life.